As what Dr. Wells posted last month, there have been reports on Phylloxera galls this season and I have seen them myself in a couple of orchards. 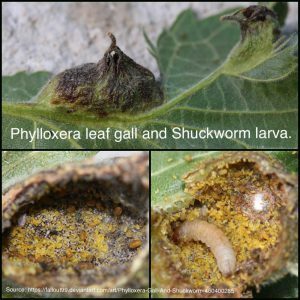 Phylloxera outbreaks have been known to correlate with increased first generation shuckworm populations. Hickory shuckworm females favor to lay eggs in the Phylloxera galls and the dead leaf tissues on the galls can serve as food for developing shuckworm larvae (see picture below). Therefore, for those with Phylloxera outbreaks, you may have to manage for shuckworms. You can use caterpillar products such as Intrepid or Dimilin against shuckworms. You can also use Minectro Pro but keep in mind that you can apply no more than 24 oz/season. Also, avoid using pyrethroids and chlorpyrifos (Lorsban) as these are hard on beneficial insects and could cause early aphid outbreaks. 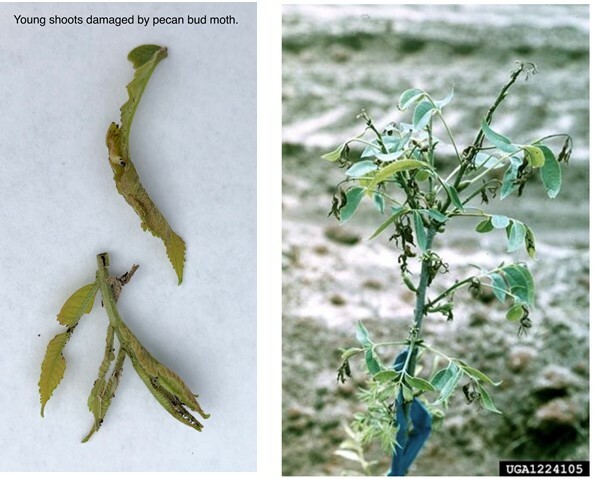 Another moth issue that I’ve seen, especially for young trees that are still actively flushing, is pecan bud moth. There are about 5 generations of bud moth in GA and trees with fresh young tissue growth may be vulnerable to attacks. If you are seeing bud moth infestations in young trees (see below), you can use caterpillar-targeted materials such as Intrepid, Dimilin. Minecto Pro could also work on bud moths but remember the seasonal maximum for this product.